What Law is Family Separation Based On? There is no federal law that stipulates that children and parents be separated at the border, no matter how families entered the United States. Family separation is a direct result of the “Zero Tolerance” policy announced on April 6, 2018, by the Trump Administration and officially enacted on May 7, 2018. Since the roll-out of this policy, the Department of Homeland Security sends everyone who enters or attempts to enter the U.S. without authorization to the Justice Department for prosecution. Adults facing criminal charges are detained, and the children are forcibly separated from their parents and housed in separate detention centers pending immigration review and deportation. 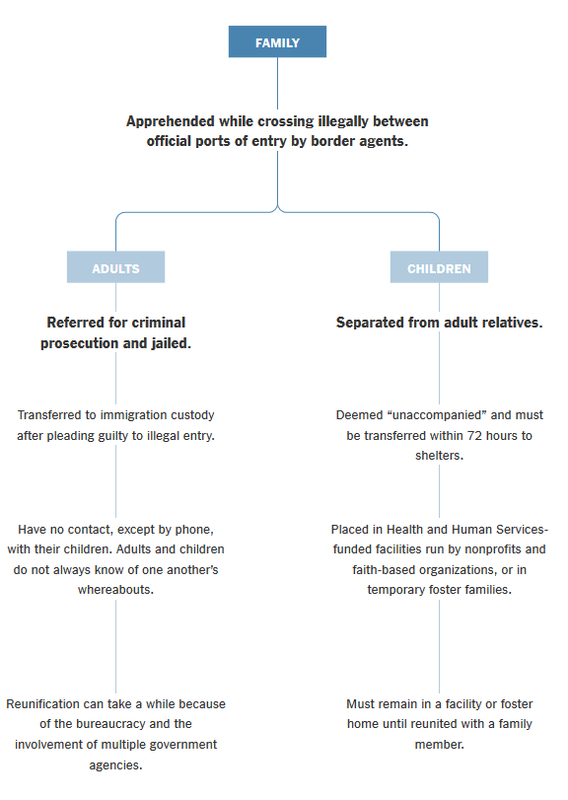 The NYT provides the below chart on the procedure that has been followed at the US border under Trump. Prior to the Zero Tolerance Policy, immigrants were 1) turned around and sent back across the border or 2) determined by CBP to be valid asylum seekers. Asylum seekers were detained as a family unit until they were paroled or had their case heard before an Immigration Judge. NOTE: On June 20, 2018, the Trump administration signed an Executive Order to end family separation. Since the enactment of the Zero Tolerance Policy, over 2,000 children have been separated from their parents. Pursuant to the new proposed policy, children will remain with their parents in Family Detention Centers. What is an Immigration Detention Center? Detention Centers are generally for-profit holding centers, much like prisons, for those who are believed to have entered the U.S. without proper legal status. Individuals may be held in either an Immigration Detention Center (for single adults) or a Family Detention Center (for family units) while they wait to appear in immigration court or be removed (deported) from the U.S. 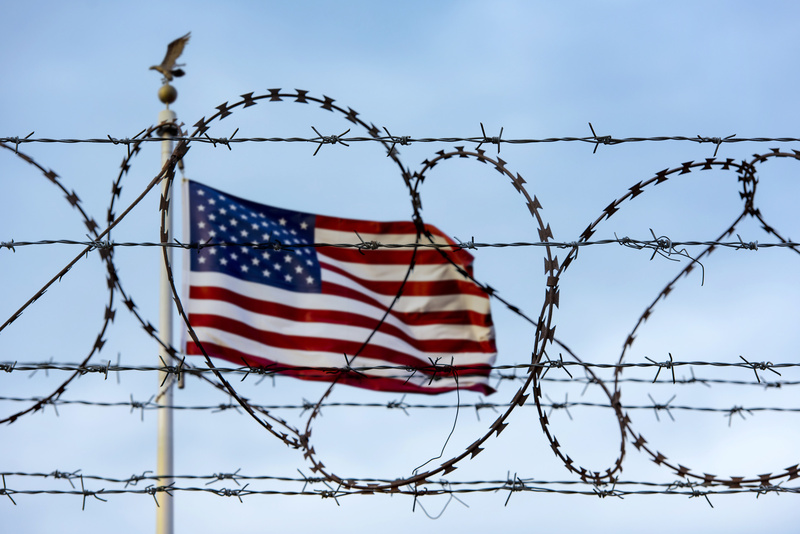 Under the “Zero Tolerance” policy, anyone who enters or attempts to enter the U.S. without authorization is sent to a federal prison for criminal prosecution or sent to an Immigration Detention Center. Rather than allowing families to remain together in a Family Detention Center, children are forcibly separated from their families and sent to a separate shelter. This includes infants and children with special needs. Over 2,000 children have been separated from their parents. Special needs children and children under the age of 12, including nursing age babies, are separated from their families and sent to one of at least 3 “Tender-Age” detention facilities in Texas. It is unclear because the policy is so new and details have not been forthcoming. Generally, the children are first taken from their parents and placed in Customs and Border Protection (CBP) Facilities – the crowded cage-like detention centers that have been widely circulated in the media. The children are then processed through the Office of Refugee Resettlement (ORR), which houses them in various ways, including handing them off to a foster home and shelters operated by ORR. ORR typically houses unaccompanied immigrant children, who crossed the border alone, in these ORR shelters. More than 10,000 immigrant children are kept in ORR shelters. The ORR is now also tasked with housing these de facto foster children separated from their parents pursuant to the Zero Tolerance Policy. Uniting children with their parents is often difficult, and in many cases, the parent will be deported while the child remains in the U.S. in ORR custody pending their own deportation. There is no formal process or clear protocol for tracking parents and children within the system. The chaotic roll-out of the policy and inadequate record keeping make it difficult even to know where a child might be detained. Many organizations fear that reunification will ultimately be impossible for some families. Despite the new proposed Executive Order to end family separation announced on June 20, 2018, over 2,000 children are now separated from their parents. The Refugee and Immigrant Center for Education and Legal Services (RAICES) is a non-profit is located in Texas and is currently raising funds to pay bonds for the parents to be released from the detention center and also provide legal representation for the children. The Young Center for Immigrant Children’s Rights is a national human rights organization that advocates for the rights and best interests of unaccompanied immigrant children. Young Center attorneys and social workers, along with bilingual volunteers, are appointed as Child Advocates (guardians ad litem) to advocate for the child’s best interests—from custody and release to the ultimate decision about whether the child will be allowed to remain in the U.S., and coordinates the child’s reunification with parent(s). Our partner Beata Leja is on the Board of Directors of this organization. Kids In Need Of Defense (KIND) provides staff and pro bono attorney partners at law firms, corporations, and law schools nationwide to represent unaccompanied immigrant and refugee children in their deportation proceedings. The Asylum Seeker Advocacy Project (ASAP) prevents wrongful deportations by providing community support and emergency legal aid to refugee families. The National Immigrant Justice Center represents and advocates for detained adults and children facing removal, supports efforts at the border, and represents parents in the interior who have been separated from their families as a result of aggressive enforcement. If you are an attorney, contact these or other local organizations to volunteer as legal representatives. Call your Senators and Representatives to urge them to support the Keep Families Together Act and HELP Separated Children Act, bills that would stop these separations. The American Civil Liberties Union offers a script and an automatic call tool for calling Senators. The American Immigration Lawyers Association (AILA) also offers a call script or prepared email to your legislator. Participate in a June 30, 2018 march protesting family separation.